Oakridge is pleased to offer a number of its amusement activities for venues to use. We can provide the activity as well as trained staff members to function as operators. Some activities may be operated by the venue, but others require Oakridge staff operation. Climbing Wall. 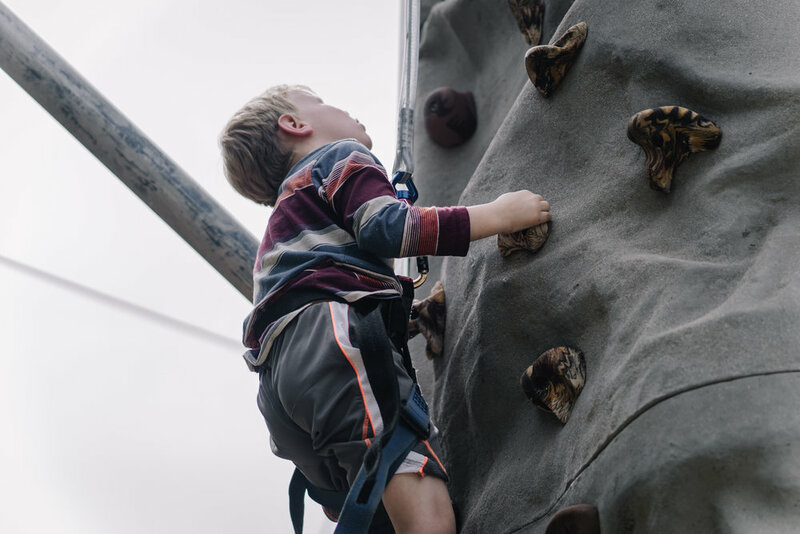 The Climbing Wall may be rented without the Power Bounce, but please note that the Power Bounce cannot be rented without the Climbing Wall, due to the setup of the Bouncers. 24-foot-high rock wall with four climbing stations. 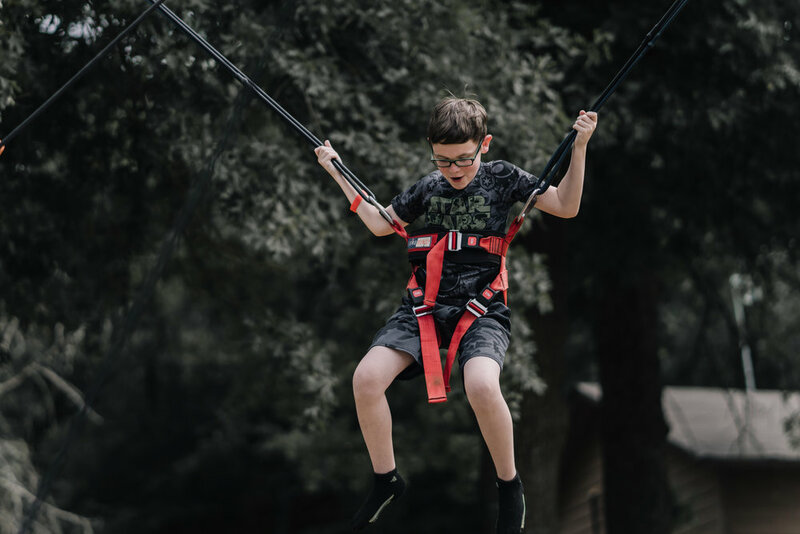 Rental includes all equipment, auto-belay system, harnesses, and one trained operator. Requires 30'x30' flat area. $750 for up to two hours; $100 per additional hour. Power Bounce. Only available as an add-on to the Climbing Wall. Two 24-foot bungee power bongo bouncers. Rental includes all equipment, harnesses, and two trained operators. Requires electricity. $500 for up to two hours; $100 per additional hours. Rental includes all equipment: uniforms, masks, 20 guns, and paintballs. Requires large outdoor play area. $1,000 for up to two hours; $200 per additional hour. Indoor/outdoor use. Rental includes all equipment: 20 guns, six obstacles, and one trained operator. We recommend that the Guest Venue provide extra obstacles or set up in an area with natural obstacles. Requires large playing area (outdoors at night is best) and electricity. $600 for up to two hours; $100 per hour for additional hours. An all-out war using padded arrows! Rental includes all equipment: 16 bows, 68 arrows. Requires large indoor play area. Slightly older unit, but still excellent for smaller children! 15x15-foot bounce house with all equipment and one trained operator. Requires a 20x20-foot flat area and electricity. $150 for up to 2 hours; $50 per hour for additional hours. Like an enclosed, extreme version of dodgeball. It's every man for himself! Rental includes all equipment, balls, and one trained operator. Requires a 30x30-foot flat area. $250 for up to two hours; $50 per hour for additional hours. A variation on the classic 4-square playground game. Rental includes all equipment, balls, and one trained operator. Requires a 20x20-foot flat playing area. $200 for up to two hours; $50 per hour for additional hours. Venue pays Oakridge the full Amusement Total Cost to set up and operate amusements at no charge to patrons. This option allows for the additional rental of Small Amusements (see below). Venue pays Oakridge 50% of the Amusement Total Cost to set up and operate amusements at some charge to patrons. The option does not allow for the additional rental of Small Amusements. Giant chess/checker board with pieces. $100 for two hours; $25 per hour for additional hours. Giant Jenga tower. $100 for two hours; $25 per hour for additional hours. Giant Connect 4 game. $100 four two hours; $25 per hour for additional hours. Giant Backgammon board with pieces. $100 for two hours; $25 per hour for additional hours. Similar to Corn Hole: four large colored boxes and up to 12 colored bean bags for tossing. $100 for two hours; $25 per hour for additional hours. Do you want to offer refreshments at your venue? Oakridge staff will gladly serve bags of popcorn and a variety of snow cones. Or with some training, you can simply rent the equipment and your staff can serve your guests! POPCORN MACHINE: Includes all equipment, popcorn, oil, bags, and one trained operator. Generally, $1 per bag. Venue will reimburse Oakridge for popcorn given out OR Oakridge will sell popcorn individually. SNOWCONE MACHINE: Includes all equipment, ice, cups, and one trained operator. Generally, $2 per snowcone. Venue will reimburse Oakridge for snowcones given out OR Oakridge will sell snowcones individually. COTTON CANDY MACHINE: Includes all equipment, flavors, cones, and one trained operator. Generally, $2 per cone. Venue will reimburse Oakridge for cotton candy given out OR Oakridge will sell cotton candy individually.